Known as Labour Day or May Day, depending upon your generation and/or on which side of the Iron Curtain you lived. At one time Americans danced around the May Pole on May first. Not long into the 50s Americans watched Soviet missiles parade in front of the Kremlin on May Day and figured that it just looked too pansy-like to be seen dancing around a pole while the enemy paraded his tanks. So, they dumped the pole. Every Monday morning the International Herald Tribune publishes a list of no-work days in its 'International Traveler/Update' corner ... usefully found on page 2, lower left quarter. Curious as to why others have circled this day on their calendar (and I, not) I usually turn to "This Week's Holidays" first off. 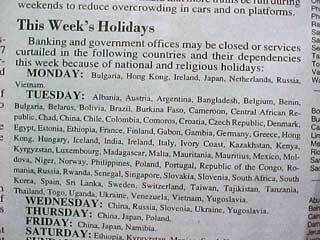 "Banking and government offices may be closed or services curtailed in the following countries and their dependencies this week because of national and religious holidays." Always preceding the marching out of the days, "Monday, Tuesday ... Sunday", this sentence is not very useful. There is no indication anywhere as to what is being celebrated, mourned, whined about, bewailed, wept over, gloated, reveled in or otherwise given a circle on the calendar. On Monday, yesterday, only seven places shut up shop. However, what Bulgaria, Ireland and Vietnam have in common is not told to us. Today, a rough count shows about 95 places not opening for the day. We can safely guess that May Day is the reason for most if not all of the 'closed for business' signs. Incidentally, the USA is not one of the ones listed on page 2. Tomorrow ... and for the remainder of the week ... each day has a few adherent states wanting to grumble or stamp their feet in glee over something. Yugoslavia and China will not do business on Wednesday. On Thursday, Japan and Poland agree to close their doors. Namibia and Japan have Friday off. On Saturday both Kyrgyzstan and Mexico will take siestas. Bangladesh and Bulgaria have something special set for Sunday. 1 Obviously, in many places on our globe there will be overlaps. For example, a war might have ended cheerfully for some people on the same day that a powerful commercial lobby has seen fit to honor 'cheese' as a wholesome ingredient in a diet. A day set aside to remember someone holy might also herald the play of a fresh sporting season. Do these five states alone officially mourn the death of Leonardo da Vinci (1519)? Are the air-battle-buffs in these countries powerful enough to force the anniversary of the birth of The Baron von Richthofen (1892) into a national day of happiness? Surely they are not marking the day that The Hudson Bay Company was chartered (1670). Hardly can they be lifting their flutes to the 46th anniversary of the introduction in Britain of VHF sound broadcasting. ... but ... could it be ... no ... well ... maybe ... anyway, 55 years ago (remember, the holiday is in just five countries) inmates of Alcatraz, the infamous prison just off shore from San Francisco, revolted. Two guards and three inmates ('5', again) were killed before marines using bazookas and tear gas quashed the revolt. "Along with black taxis and red buses, one of London's most distinctive features is the wallpaper in its phone boxes: a lurid, eclectic mosaic of cards advertising the services of the city's prostitutes." "Disappointingly for clients, the increasingly explicit images and alliterative slogans that adorn the cards often bear little relation to the actual services on offer. But ministers and councilors are more anxious about the impression they make on children and foreigners. Tourists, they say, are offended – though confusingly the Home Office also reports that cards are often aimed at the tourist market. Some central London schoolchildren have begun to collect and swap them, as a free alternative to Pokemon cards." The Economist estimates that in the borough of Westminster alone as many as 150 people are kept fully at work in just the 'papering' part of the business. Earning about 30 pounds ($42.90 or 1956 Thai Bhat) for each 100 cards that they post it's no wonder that they move around like honeybees. 2 For those of you who are happiest with footnotes, please keep in mind that at the very bottom of my Home Page you'll always find a refreshable 'tart'. Through some magic from Paul, each time that your 'clicker' takes you there anew ... well, you'll be greeted by someone anew. It's another day off for bank clerks and government workers! But, says the IHT, only for those in China, Japan and Poland. And 'why,' say we. While the Tribune gives us not a hint, our NEWNES comes up with the answer for Poland. 1791: The Polish Constitution reformed. GENEVA – According to an account published in the Bale newspaper "Basler Nachrichten, "the traffic in dwarfs from Hungary has become so widespread that the demand exceeds the supply. These pigmies are taken to Germany, where they are exhibited in circuses, theatres and variety shows. The "Nachrichten" cites one instance of an impresario who paid to the parents of three dwarfs of good physical condition thirty million francs. In the region of Borsod, protests have arisen from many who have appealed to the Government to put a stop to the lucrative trade. On the other hand, there are some who insist that the Government should keep its hands off, because they say that the traffic supplies an important source of revenue for the poorer classes of people. A man pointing at a wrecked car. A man pointing at a dead something-big. A man pointing at a bunch of nearly naked women. Of which do you want to know more? Or, would you prefer that I return to the IHT and give you the list of the "10 U.S. Airports With the Greatest Number of Delayed Takeoffs or Landings in 2000"? The monsoon season is not far off ... at least for The Oriental. The first few days in May usually see some sort of preparation. Marching out the distance between tent spikes? Well, sort of like that. Engineers eyeing the brace-holes for any blockage. Waitresses worrying about what the night's exposure will do to their hair. Greeters nervously checking out the sky even as they smilingly usher guests to an open-air table. The main floor can tolerate the odd whoosh of rain ... in fact, a rolling storm adds quite a bit of color ... but, when fully 3 out of the last 4 sunsets also bring water ... and, thereby, send the diners, plate in hand, to shelter ... well ... it's time for the poles and the sheets of canvas to come out. This morning my Excel program told me that I've spent 406 nights at The Oriental. More, if I had started counting earlier. Maybe it's time for a change ... ... perhaps, a big one.